The first campaign tackled the taboo in Vietnamese culture. In Vietnam, one of the most sensitive things for people to talk about is breast cancer. So, we mentioned breast cancer without talking about it. One simply cute emoticon was created: A pair of breasts ( . )( . ). With “people as media” strategy, a three-consecutive-years campaign was roundly activated. To start the conversation, an animated short film about ( . )( . ) and a song performed by Uyen Linh Idol were released in 2013 which engaged not only women but also their loved-ones. We leveraged our sign key asset ( . )( . ) and proved that actions really can speak louder than words. By texting ( . )( . ) to 6136, people could receive information of breast cancer awareness and share it with the ones they care about without direct conversation. In 2014-2015, We care for her ( . )( . ) extended the movement to offering screen test to women across Vietnam. The campaign has reaped a significant social impact and the official recognition from Vietnam Ministry of Health. 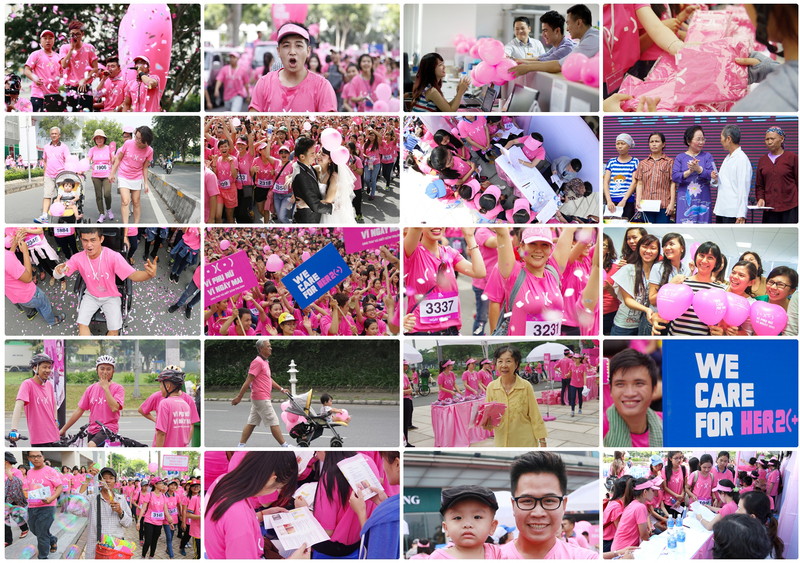 On Vietnamese Women’s Day - 20/10, a Pink Parade was held to promote prevention and early detection of Breast Cancer. More than 10,000 people joined with their beloved women in exciting activities such as biking, jogging, and breast screening.